The Bega Valley Shire is alive with cultural activity which enriches the lives of local residents, and attracts thousands of visitors to the area annually to share in our festivals, exhibitions, performances and creative spaces. Bega Valley Shire Council is committed to supporting our cultural communities, and the opportunities that cultural activity brings to the Shire. This commitment is expressed throughout Council’s Community Strategic Plan, Bega Valley 2030 and is further defined through the formalisation of the Cultural Setting Report which is a key implementation stage in setting out what Council will do to achieve Bega Valley 2030. Increase awareness and understanding of the significance and potential of the cultural life of our communities. Ensure that key aspects of the Bega Valley’s cultural strengths and opportunities are identified and highlighted to encourage and provide a platform for discussion with community, government and industry partnerships to enable cultural development planning and support. Support and encourage an environment that is conducive to active, diverse and rewarding cultural endeavour and enterprise. 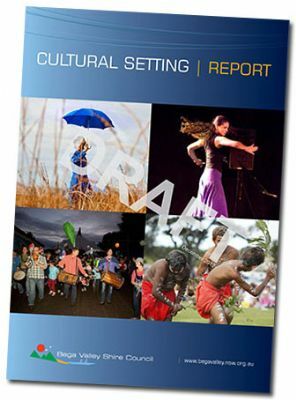 The Draft Cultural Setting Report explores cultural focus areas which are significant to the Bega Valley community. These focus areas provide a summary of the current cultural activity and direction of our community and cultural industry. Effort has been made to capture as much of the community and business activity that is currently happening within the Bega Valley to provide a picture of the array of cultural activity, it is appreciated that this is a dynamic sector, and areas and industries will evolve over time. In response to the Draft Cultural Setting Report, Council has developed a ‘Response Paper’. The Response Paper is currently on public exhibition and has been developed to assist Council and the community in working towards a vibrant cultural future. The Response Paper highlights opportunity areas for development within the Bega Valley, outlining Council’s current commitment and activity which supports this area. Following the public exhibition period, Council will review all feedback and make amendments as seen appropriate. The Response Paper and Cultural Setting Report will be collectively endorsed by Council as a supporting document to the Community Strategic Plan by June 30 2013.